One could easily argue that the push for independence by the American colonies, and the effectiveness of the Colonial armed forces against King George III’s finest, was rooted in the great New England tradition of breweries and distilleries. In fact, no less a luminary than Gen. George Washington once insisted that spirits were an essential performance enhancer for the troops. Ken Lorenz, founder of Spirits of Old Bennington, the only distillery in southwestern Vermont, smiles when hearing this story. Lorenz spent years planning the creation of his local distillery, and he has a firm grasp of the craft’s history -- and how it relates to the present day. Vermont may not have been one of the original 13 colonies, instead setting for the honor of being the 14th state. Still, the fabled Green Mountain Boys militia contributed greatly to the American march to independence, and Vermont’s stills surely helped its fighting sons make merry. Given this, and with an eye and ear toward General Washington’s dictum, Spirits of Old Bennington is located less than a 10-minute drive from the site of the 1777 Battle of Bennington. The distillery is housed in the old Vermont Tissue Co. plant on Route 67A, right next to the Paper Mill Village Covered Bridge across the Walloomsac River. Lorenz is a former General Electric engineer and project manager and lives with his family just across the state line in Hoosick, N.Y. He had long dreamed of operating his own business, and a past trip to Scotland inspired him down the path of distilling spirits. 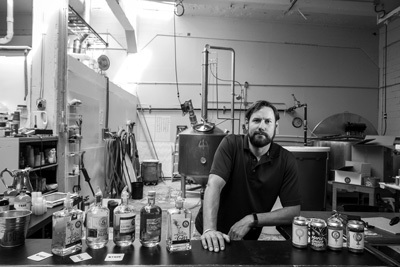 At one point, the thought of owning a bar was on Lorenz’s radar as he sought ways to mix his aspiration of being a proprietor with his attraction to the growth opportunity inherent in distilling. But from that early idea, he said, he transitioned to the goal of running his own distillery. He talked to many people in the business who’d had varying levels of success. But even those who’d encountered difficulties “all liked the industry, so the positive comments pushed me forward,” he said. Finally, in 2014, after several years of research and speculation, Lorenz and his wife, Alexis, established Spirits of Old Bennington. With the help of North Bennington entrepreneur William F. Scully as landlord, the distillery moved out of its original business incubator location and into the former Vermont Tissue mill in 2015. Scully’s company, Carbon Zero LLC, has owned the property since 2009 and operates the adjacent redeveloped hydroelectric plant. Lorenz said he forged ahead at first with a small, 8-gallon still, making apple brandy from apples from friends’ trees and a few runs of corn whiskey. He recalled with a laugh that it was a “crazy idea” to start a distillery from scratch, but he quickly became immersed in it. “I had brewed beer in the past but really took to the art of distilling,” he said. Lorenz was quick to acknowledge that without the support of Alexis – whose day job away from the distillery “kept our family on a sound footing” – none of this would have been possible. But even after his early days as an aspiring craft distiller, many lessons were yet to come. As Lorenz worked long days to achieve early benchmarks, Spirits of Old Bennington introduced products in both Vermont and New York. As these first successes arrived, so did the unforeseen. He realized that something, or someone else, was required to realize his goal of growing the business to the next level, so he turned to a familiar place for assistance. Since 2013, Lorenz had relied on interns from the business program at Southern Vermont College to help him with many of the distillery’s startup requirements, most notably the drafting of his first business plan. And last year, he went back to the college’s deep well of talent, as business professors Stacey Hills and Jeb Gorham took on roles at Spirits of Old Bennington. The two academics, who both have experience as business practitioners, began assessing Spirits of Old Bennington as a potential partnership opportunity. In return, they offered Lorenz skills and proficiency in marketing, branding and business development. In late 2017, after a trial run that began in the summer, the three became formal partners in the distillery, moving forward as co-founders. Hills oversaw brand marketing, and Gorham assumed responsibility for development and expansion. “Distilling is one thing, but bringing in Jeb and Stacey was the best business decision I made, and I wish I had done it earlier,” Lorenz said. Today, Spirits of Old Bennington boasts a tasting room open to the public at varying seasonal times, and it’s moving forward with increased production, distribution and marketing. To that end, Spirits of Old Bennington’s product line has evolved from Lorenz’s early startup tinkering to an appealing series of spirits that include several twists, flavors and subtypes. Under Hills’ marketing aegis, these drinks now have engaging new labels and monikers that echo local history: Kilted Wheat Whiskey, Covered Bridge Rum and Sedition Gin. This sort of visual link between a product and a historical tourist attraction bodes well for the distillery, since the lack of a full-fledged national movement of craft-level distilling does not give it the same marketing advantage enjoyed by beer micro-brewing for the past 25 years. Nevertheless, Hills said, new customers must be won over one at a time. It’s important for the public to give a try to products from Spirits of Old Bennington, she added. Gorham said every effort for business development centers on a measured but steady 400-gallon annual output. The distillery plans to expand by creating a social club with a pool hall, darts, games, indoor bocce and shuffleboard. Product growth, Gorham added, remains central to all other efforts and can include partnering with local restaurants and other establishments and organizations to put on events that will help introduce what the three partners see as their most promising new initiatives. Gorham said the three co-founders have invested considerable “sweat equity” in the distillery. As a result, he predicted, Spirits of Old Bennington is poised to take advantage of industry growth because of diligence, planning, creativity – and willing customers. Spirits of Old Bennington is at 1514 North Bennington Road (Route 67A) in North Bennington, Vt. For more information, visit www.spiritsofoldbennington.com or call (802) 468-7662.